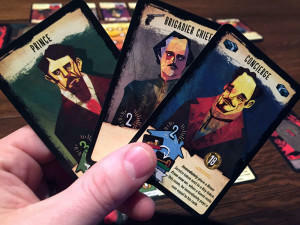 We review the new card game The Bloody Inn, published by Asmodee Games. With a unique theme , great artwork, and easy to learn rules, this clever little card game is worth checking out for fans of engine building games. Set in a remote area of France in 1831, a family of rural farmers are determined to make their fortune. Their diabolical plan? Invest in an inn so the can rob travelers and get rich. And since people tend to complain after they’ve been robbed, there is only one sure-fire way to keep their victims quiet. Make sure they don’t leave the inn alive. 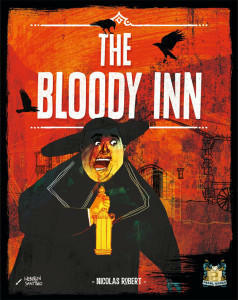 That’s the rather unique theme to The Bloody Inn, a new card game designed by Nicholas Robert. In The Bloody Inn, players take on the role of the proprietors of the inn, trying to earn some Francs through any means necessary. Does this rather dark theme make for an entertaining game? Time to find out! 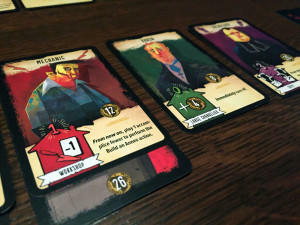 The Bloody Inn is an economic and hand management card game for 2-4 players that takes about 45 minutes to play. In our experience, The Bloody Inn plays best with 4 players. 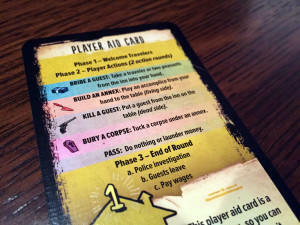 The Bloody Inn is played over a series of rounds where each player gets two actions. The actions include: bribing people, building annexes, killing travelers, or burying corpses. All this is done with the goal of stealing the most money from the victims. However players must be careful, for if the police should show up, any unburied bodies will cost you precious money. Some wise hand management combined with a healthy dose of engine building will be the focus of The Bloody Inn. After the draw deck has been emptied twice, the player with the most Francs is the winner. The Bloody Inn gives players a unique theme with some outstanding artwork. The main thing that drew me to The Bloody Inn, other than the unique theme, was the outstanding artwork. The dark and creative style really drew me in and felt like it fit the theme of the game perfectly. Each card is colorfully illustrated with a picture of the guest, and also contains any relevant game information. In addition to the cards, the game comes with a central game board that acts as both rooms for the travelers and also a money tracker for the players. The game also includes a variety of cardboard tokens to track money and other game effects. I found the rulebook to be well laid out and I had no troubles learning how to play the game. Overall, The Bloody Inn had some solid production values. 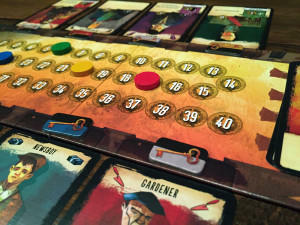 Players have the option of playing either a long game or a short game of The Bloody Inn. Depending on the game length desired, a certain amount of cards are removed from the deck before the game. Each player begins the game with 10 Francs, two peasant cards, and a room at the inn. Phase 1: Welcome travelers – Travelers are drawn from the deck and placed face up in each room of the inn. Phase 2: Player Actions – On a player’s turn, they can take one of 5 different actions. The limited amount of actions ensure that rounds will go by quite quickly. Bribe a guest: Choose a traveler in the inn, play as many cards from your hand equal to the rank of the guest being bribed (0-3) and take the bribed guest into your hand. Any cards you played that have the bribe symbol are returned to your hand with the rest being discarded. 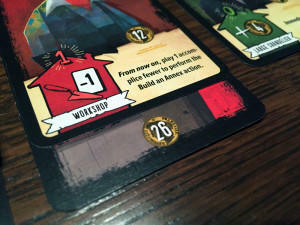 Build an annex: Choose a card in your hand. Play it in front of you, discarding a number of other cards equal to its rank. Any cards discarded with the shovel icon are returned to your hand. Once an annex is built, it will give you a special ability for the rest of the game and also allow you to bury corpses underneath it. Kill a guest: Choose a guest in the inn. Discard as many cards from your hand equal to the rank of the guest being killed. Return any cards played with the gun symbol back to your hand. Take the victim and place it face down in your play area. Bury a corpse: Choose one of your face down corpses. Discard cards equal to its rank, returning any with the coffin symbol to your hand. Place the corpse under anyone’s annex. Gain the money listed on the corpse. If you buried it under an opponent’s annex, you split the money. Pass: If you pass, you can visit the money launderer. The money track caps out at 40 Francs. The money launderer will let you exchange money for checks. Spend as much money as desired from the track and gain an equal number of checks (or vise versa). Phase 3: End of Round – If there are any corpses in play and police still in the inn, each player must pay the grave-digger 10 francs to dispose of their corpses. Any travelers still in the inn go to the discard pile and whichever room they were in earns that player 1 Franc. Finally, each card still in a player’s hand costs them 1 Franc per card they wish to retain for the next round. After that, the next round begins in the same manner. Rounds are repeated until the draw deck has been depleted twice. Once this happens, players total up their Francs and checks. The player with the most money is the winner. Each guest card can be used in a variety of different ways and many have their own unique special abilities. 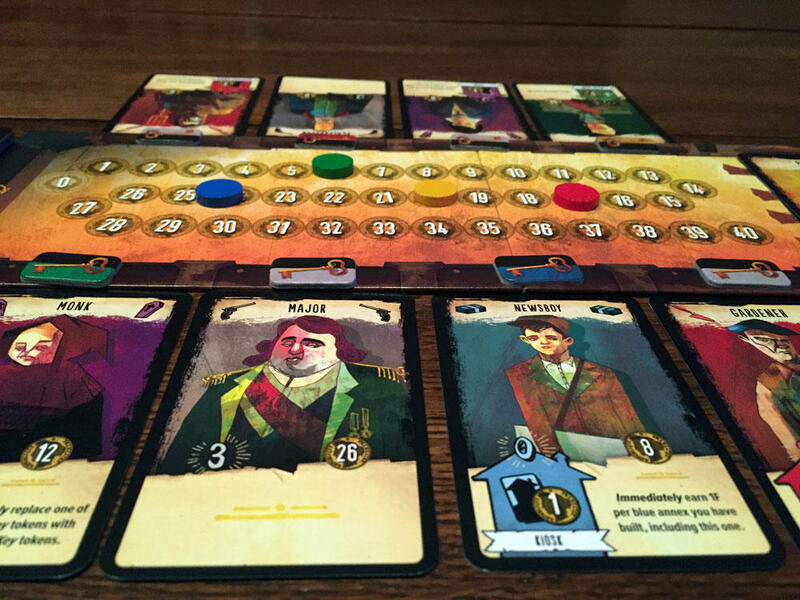 The Bloody Inn was one of the 2015 Essen releases that I was really looking forward to trying. A unique theme combined with some stellar artwork always piques my interest. All this combined with cards that can be used in more than one way is usually a win in my book. For the most part, I did really enjoy The Bloody Inn. It’s a hand management and engine building game with some really solid mechanics. It’s also one of those games where you almost always feel like you don’t have enough actions. Each round, players get only two actions and let me tell you, you will always feel like you need at least twice that, if not more. That’s actually one of the things I like and don’t like about The Bloody Inn. Cards can be built for their special powers, which also allows players to bury corpses under them. I like it that it makes the game full of hard choices and a bit of risk taking. Do I draw up cards or go for the kill. Do I build this annex or convert some of my money. You will ALWAYS have a hard time deciding what to spend your limited actions on each turn. On the other hand, these super limited rounds do make some rounds much less exciting than others. There will be rounds where you basically spend your turn drawing cards for future rounds. Other times, you will spend your turn converting money. This can give the game some extreme highs and lows, with some rounds being exciting and then some being really dull. When it comes to the engine building aspect of the game, it’s definitely on the slower side of the bell curve. With those limited rounds, it will take you quite a few rounds to acquire the annexes you want to build and the people to build them. It’s got almost a slow burn feel to it where you can see the game ramping up, but it takes a while to get there. That’s also a thing that can make The Bloody Inn a little unforgiving. Mess up in the early rounds, and you can get behind in the game pretty quickly. The game can give you the feeling that when someone’s in the lead, it can be hard to overtake them, especially if they have been able to play better annexes. Now I’m not saying the game should punish players for executing their strategy better in the early rounds, but the game doesn’t have much in a way of a catch up mechanic. The score track cleverly caps out at 40 Francs, forcing players who get a windfall to waste turns at the money launderer. The game does try a little bit at least with their money mechanic. Players have to make sure to save money to pay for their cards in their hand, so hoarding cards is usually a bad idea. And the game board capping out at 40 Fancs does force players to waste turns trading money for checks, so someone with a windfall will have to pause their engine to make change. One of the nice things about The Bloody Inn is that it does seem to have many paths to victory. There is a nice variety of cards and, since you won’t always see every card during the game, this forces players to be flexible with their strategies. Tailoring your gameplay based on a few cards is usually a bad idea if you aren’t sure if they will even be in the deck. Finally, when it comes to player scaling, The Bloody Inn plays well with any of its player count. I do think the game plays best with four players though. Not only does it have more cards coming into the game, but since you can bury your corpses under any players annex, it allows you to spread out the wealth a little bit. In a 2 player game, I never wanted to bury under my opponent’s annex because it’s giving both of us money. The Bloody Inn does a lot of things right, from its fantastic artwork down to its solid mechanics. I could see the macabre theme being a turn off for some, but to be honest, there is nothing gruesome about artwork that should turn anyone off. So I think only the most sensitive of players need to worry about the theme here. The game play itself, while fun, can also feel a bit restrictive at times, especially with some of the less exciting rounds you will be forced to take. The Bloody Inn offers to let you play a short game or a long game and I almost wish there was something in the middle. The short game definitely feels too short, I’d only recommend that for a learning game. However, the long game starts to drag near the end of its play, especially if a player is clearly in the lead. I think something in between would definitely hit the sweet spot for play time. Even still, I found The Bloody Inn to be an enjoyable game that has already made its way to our tables a few times. If you are a fan of engine building or hand management games, I can easily recommend this one. It feels fresh and I don’t have much else in my game library like it. If you’d like to pick up a copy of The Bloody Inn, you can get it for about $23. Final Score: 4 Stars – A great little card game that combines some solid hand management with a slow engine building mechanic. Has anyone tried house ruling 3 actions a round?